Diamond Platinum Overlay Sterling Silver Ring 0.530 Ct.
We all know that diamonds are a girl's best friend. It doesn't matter what your style, diamonds go with absolutely everything so it's no wonder diamond jewellery is highly sought after. Diamonds really are forever, which makes them the perfect choice for all jewellery designs. Known as the unbreakable stone, diamonds can stay looking beautiful year after year, making them a classic and must-own stone. As well as looking gorgeous, diamonds are also the hardest mineral on earth, which means they will last for years; making them the perfect investment so why not treat yourself to dazzling diamond ring or a timeless pair of diamond Earrings. The earliest known diamonds were discovered in India, where they were found in the country's rivers and streams. It has actually been suggested that India started its love affair with the gemstone as early as the fourth century BC. Diamonds were believed by some ancient peoples to offer protection from home, which made them popular gemstones to include in armour. Kings would have their leather breastplates studded with diamonds in an attempt to harness their God-given powers to bring them luck and protect them as they led armies into battle. It was also believed by the Ancient Greeks that diamonds were fragments of stars that had fallen earth. This made them highly sought after, especially as it was thought that those who wore them were blessed with love and purity. When it comes to the cost of diamonds, their quality, is decided through the grading system of the four C’s - cut, clarity, colour and carat weight. 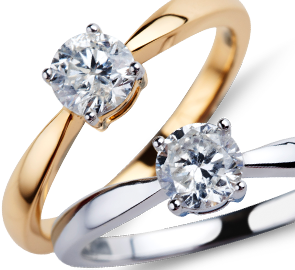 One of the most popular pieces of diamond jewellery is the diamond engagement ring. There are conflicting histories regarding the origin of the engagement ring itself, but when it comes to giving a diamond ring upon the proposal of marriage, this can be traced back to 1477. Many people think that these desirable rocks will break the bank, but at TJC we have a gorgeous selection of high quality diamond sets in necklaces, bracelets, pendant and rings, just bursting with glitz and glamour - all at great prices. Not only does this mean you can find the right diamond to suit your style, you can also get your hands on exclusive and stunning diamond jewellery to suit your budget. After all, everyone deserves a diamond. Shop irresistible diamond jewellery at TJC now!